A parking lot for Pearl Raw Bar patrons is located on Strawberry St behind Sticky Rice restaurant. 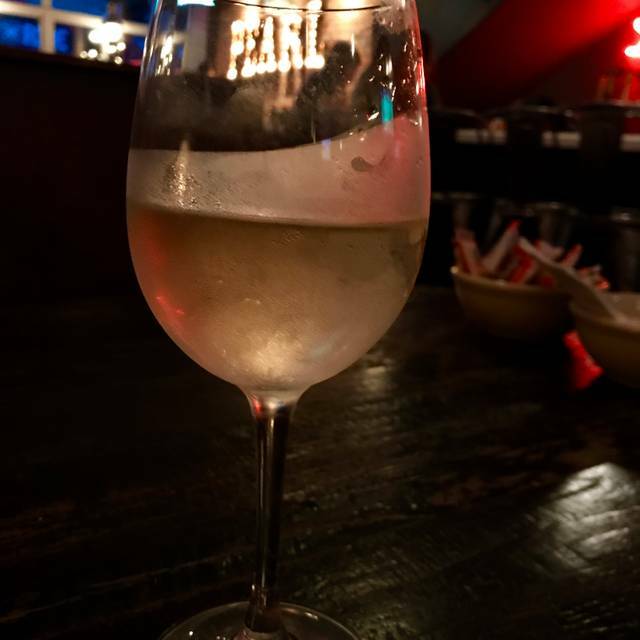 Located on Main St, in the Fan District, Pearl offers a variety of seafood specialties including local oysters, shrimp and crab legs. The decor has a classic oyster bar feel. The front room is more casual with a marble bar, reclaimed wood tables and televisions. The back sun room is a quieter dining room with sky lights and garage doors that open to the outside in nice weather. *Notice: consuming raw or undercooked meats, poultry, seafood, shellfish, or eggs may increase your risk of foodborne illness. Some foods may be cooked to order. Solid dinner. Food was solid but definitely over salted. The back room also had an odd smell and the tables were sticky. Service was good. Food was very good. We had a server in training, but she was fine, just a little slow. The food was too salty. The raw oysters were very good, thanks to being from Virginia and they were fresh. The salmon and vegetables were too salty. Love this place- always good, always friendly. Very good happy hour. Great food, it was very fresh. I thought everything was really nice, the service, the atmosphere and the food portions were nice but my order of the fish tacos with the cabbage they put inside it, the vinegar was a bit over powering everything else. Overall nice dining experience. I would go back. Food was great. Oysters were awesome (even though they were out of the Ruby Salts, my favorites). Management and Server were also awesome. The problem... The Kitchen. I ordered a simple wedge salad with my oysters for dinner. The salad arrived after I'd paid the bill. Our server kept trying to get the salad and got grief from the kitchen. Pretty sad when a $150 dinner can't be completed with a chunk of lettuce, some dressing and a few bits of bacon. We'll go back - we love the place - but the kitchen dropped the ball this night. Family brunch for 6. Pearl is one of our favorite places to have a Bloody Mary and brunch with friends and family. It’s pretty loud in the back room which is perfect for kids! Awesome place for seafood lovers, especially oysters. We had oyster sampler, crab cakes and fish and chips. All 3 were great. Went for my first time 2/25/2019. Have long seen the advertised "oyster night" for Mondays. Nothing really special or different for "oyster night." Same menu items as always, with one or two dollars off the regular price for a couple of oyster dishes. Oysters good, however. Just didn't appreciate the hype for oyster night. We were seated right away and the food was delicious.? I love my time at Pearl! I took my mom there for dinner as a special treat! It was a great experience, the only downer was the noise. I enjoy music in the background but it was just a bit too loud. But overall it was fabulous! This was the first time my husband and I had ever been to Pearl. The hubs was weary that I had gotten a 5:30 reservation only 6 hours before on the Saturday after Valentine's Day, but the atmosphere, food, and service were fantastic. We will be back to Pearl for sure! I ordered the Oysters and waffle. My waffle was burnt, bot the oysters were cooked perfectly. Great food. Don’t miss the crab dip or oyster po boy! Everything was great.....food, drinks, atmosphere, services. Will definitely be returning. We went for Valentine’s Day. A neighborhood gem we hadn’t yet tried. The seafood was fresh and delicious. Excellent backed oysters. Can’t wait to return. Great time and better food! Always a great spot. We eat here pretty often (one of the few seafood restaurants in town). The specials are usually delicious. Reservations are usually easy to get. Nice spot for seafood lovers. It was really quite there at 6pm on Saturday evening. The mussel appetizer was spectacular, but two of our group got the Mahi tacos, which weren't anything to rave about. The shrimp pasta was very tasty and not too heavy and the peel and eat shrimp and steamed crab legs were delicious. The restaurant was very quiet the night we were there and the wait staff was very attentive. We did not have dessert since my 84 year old father thought that ice cream should be served and the Pearl doesn't serve ice cream with their desserts. Food was great. I sat by the front window under a blower—-very cold! We had a really nice experience at Pearl's on New Year's Eve. At 8:30 p.m., it was loud, but quickly quieted and stayed that way until we were leaving around 10 p.m., when the bar picked up again. The Caesar salad with fresh anchovies was perfectly fresh, dressed and chilled. Croutons were not up to the rest, but no big deal. The lobster over fresh greens was nicely prepared, but the greens needed a light oil/vinegar dressing - or something. I added the former myself. The blackened tuna was perfectly prepared, but mashed sweet potatoes were much too sweet. Limited wine list, but we chose a nice red for a reasonable price. Looking around at other's plates, I know the oysters are the point, but we don't eat them. They did look like all were very happy with those. All in all, another good restaurant from the Group! Excellent! We will be back. The only negative for me was the noise level. Completely impressed how good the fish and oysters tasted. Dinner with my son who lives out of town and I chose Pearl since he wanted seafood. Turns out his favorite thing he had was the Brussel sprouts appetizer. Who knew!? We really enjoyed our night at the Pearl as a family. The oysters and cocktails were outstanding. I also had a burger which was hand made and the fries were delicious! We also really loved the brussel sprouts. Maddie, our waitress, was outstanding and kept our plates and glasses full! We hope to come back soon. Thank you for being a part of our fun holiday weekend in Richmond. We felt welcome and cared for! great atmosphere in the bar area. Cocktails were delicious. Food was quite good and served in a reasonable amount of time. The front of the house is basically a sports bar with flat-screen TVs, both a bar and booth seating and, not surprisingly, is very noisy. Things are considerably quieter in the back, and you should ask to be seated there if you want to have anything other than a shouted conversation with your dinner companion. 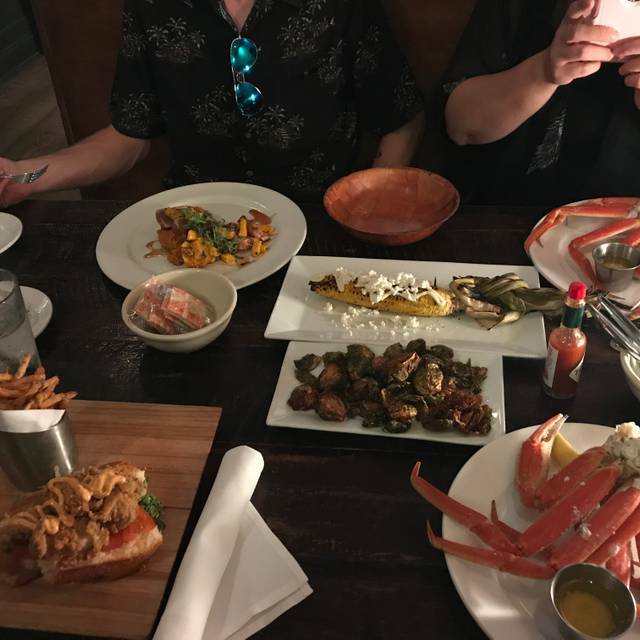 The food is basic and good and there is an extensive beer list, both draft and bottled, that complements anything you might order from the raw bar. I recommend the fish and chips (made with real cod), the crab cakes or the fried chicken. 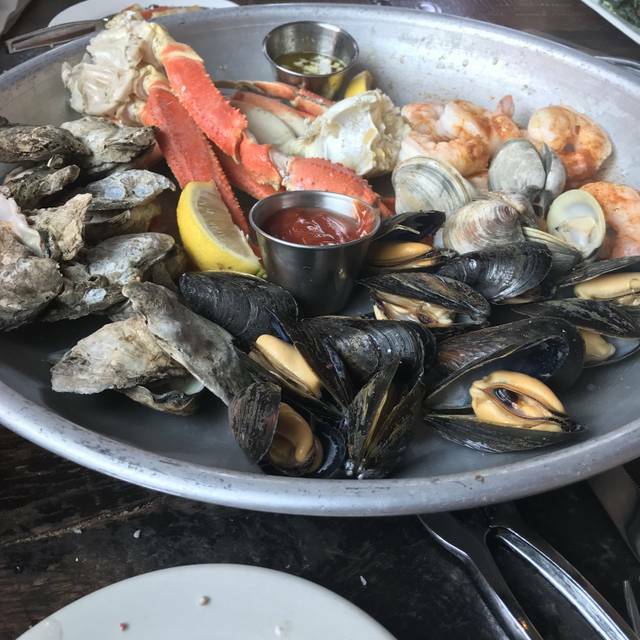 You can't go wrong ordering any of the raw shellfish (clams and a variety of oysters). Had reservations for 6 people through Open Table, but was seated right beside front door with cold air blowing the entire meal. Worst table in the place. We had eaten there before and had a good experience. But, this time the food was not nearly as good. Restaurant is in a very good location, but overall experience did not meet our expectations. We were looking for a last minute Friday Night restaurant and landed at Pearl Raw Bar. The Space is beautiful -- transformed from its previous two story space to a downstairs space with at backroom -- the Backroom was quiet and pleasant with two garage-style doors that could be opened in good weather creating an open air dining space -- we ordered appetizers only and made a meal of them - we also had Mint Juleps -- that were delightful! Everything was delicious but I particularly enjoyed the Brussels Sprouts -- with Cranberries, Goat Cheese, Pecans, and a Balsamic Reduction -- this tends to be my go to when it is on the menu and and this one was one of the best I've had! We will be back and can't wait to enjoy the backroom on a day when it is warm enough to have the doors open! Great time!! Chicken and waffles were okay. Brussel sprout appetizer was money!! Pearl is one of our go to’s for brunch. The food is always great. Took my wife there for her Birthday food was outstanding servers are great just a wonderful time will be back!